Garage door systems have been automated for a very long time now, but there are still some issues that they can suffer from over time. Of course, the electric opener isn't the only source of potential problems. Any large mechanism that operates on a daily basis is bound to experience some issues over time. When you find yourself faced with such problems, all you need to do is remember one name – Gate Repair Beverly Hills. Our professional technicians will always have your back. As some of the hardest working parts of the entire mechanism, the garage door springs are more likely to break than any other part. These aren't the only hardware components that can have some issues, but because they operate under tremendous stress on a daily basis, it stands to reason that they'll be involved a lot of the times. Spring replacement isn't a job for would-be DIY experts. It involves releasing the damaged unit and fitting the new one in its place, which means dealing with high amounts of tension. Experience and skill are required to do so safely, so if you find yourself in such a need, don't take any risks and leave it to our pros. Your garage door has a structured guiding system which ensures it moves smoothly and without shaking each time it opens and closes. Those are the tracks. When these sections become bent or blocked with debris, they can prevent the rollers from getting through, which will result in the door getting off track and then stuck. Needless to say, this is a major issue due to numerous reasons, and you'll want to resolve it as soon as possible. That's why our company offers emergency repairs with a same day service policy. You can always rest assured that help will get to you as quickly as possible when you get in touch with us. Although the electric garage door opener isn't the source of every potential problem you may experience, it can certainly experience its fair share. From broken motor gears to damage to the drive system, and even issues with the circuit board or other electrical components. Whatever the cause of the problem, our experts will have no trouble fixing it for you. No reason for you to try and figure out exactly what's wrong with your door. 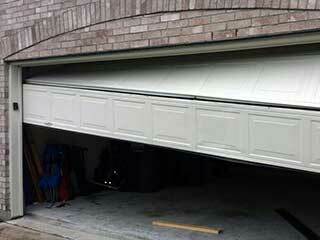 Our garage door troubleshooting services are very extensive and our technicians are always thorough. Our team will get to the bottom of the problem and apply the best solution for it, thus ensuring that your system can return to its fully functional condition in little to no time. Give us a call today and tell us how our experts can help.